I found this recipe on This Week for Dinner who found it somewhere else, who found it somewhere else, etc., so I thought it would be okay to post the actual recipe on my blog too. I made these cookies tonight since we were feeding the missionaries. They disappeared pretty fast (the cookies, not the missionaries). Even though I vowed last weekend that I wouldn't turn the oven on this summer, these cookies were worth heating up the kitchen. In small bowl blend flour, cocoa and baking soda. Mix until well blended. In large bowl beat sugar, butter or margarine and 1/4 cup peanut butter, until light and fluffy. Add vanilla and egg, beat. Stir in flour mixture until blended. Set aside. To make Filling: Combine confectioner’s sugar and 3/4 cup peanut butter. Blend well. Roll filling into 30 – 1 inch balls. 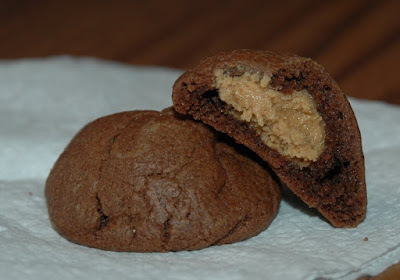 For each cookie, with floured hands, shape about 1 Tablespoon of dough around 1 peanut butter ball, covering completely. (I just grabbed a small ball of chocolate dough and flattened it and stuck a little pb filling on it. Then folded it in half and rolled it into a nice ball). Bake at 375 degrees F (190 degrees C) for 7-9 minutes. When cookies are done, they should be set and slightly cracked.